Proper installation techniques for ATS FXPTM duct on risers is outlined below. The purpose of this detailed instruction is to eliminate the problems caused by condensate dripping down the inside wall of the duct. 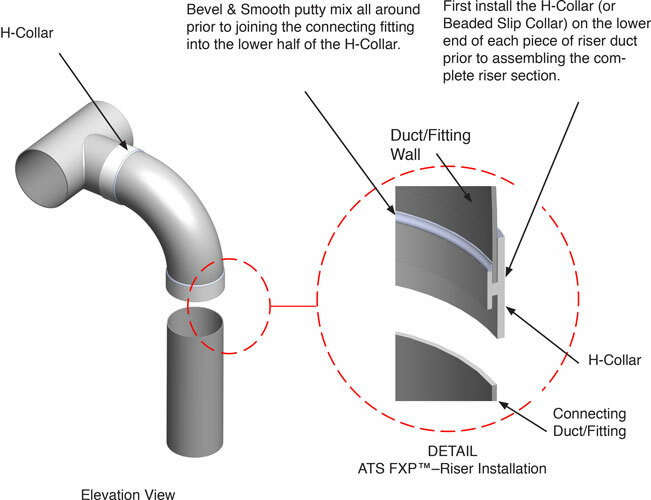 Prior to final assembly of the riser section, the H-Collar (or Slip Collar) should be bonded into the lower end of each duct. As seen in the blow-up section below, the edge at which the H-Collar meets the wall on the inside of the duct should be smeared with putty and chamfered (smoothed or rounded out) to form an impermeable barrier between the collar and the inside of the duct. This way, any condensate dripping down the wall of the duct will flow over the joining point between the H-Collar and the duct (rather than work its way in between the H-Collar and the duct). In addition, pre-joining the downstream side of the H-Collar will facilitate the final assembly of the riser.